SYNERGY was a herdsire that was many years spent waiting to be born! He was an extremely large buck, easily the tallest buck I've ever owned, with an excellent rump and a wide rear leg set. 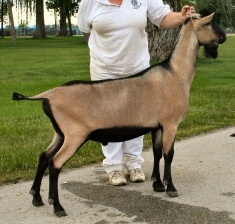 His pedigree tied back into my herd perfectly as a paternal FORTUNE grandson. 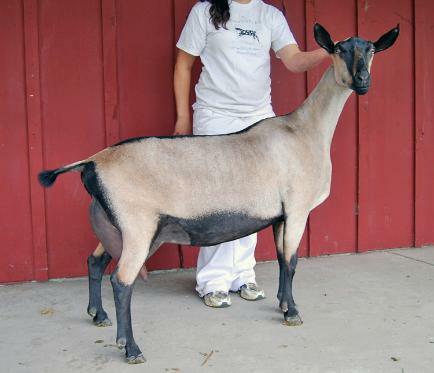 His dam, SEBASTIENNE, was an exemplary doe that I have been enamored by since the 2006 California State Fair. 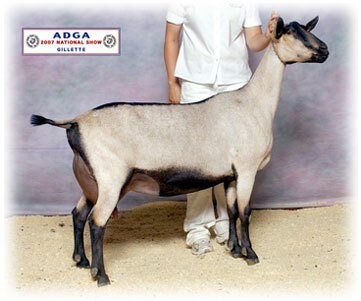 She exemplified dairy character, levelness of topline and upstandingness with outstanding production. Her dam line is linebred on GCH Redwood Hills Profet Safari 5*M - the 1991 ADGA National Champion, and appears five times in his pedigree. I'm very excited to have the opportunity to use him in different combinations with my ARMSTRONG and FORTUNE daughters. His daughters have inherited his extreme length of bone pattern with 4 first freshening two year-old daughters appraised in 2012 scoring; 88,88,87,89...they are off to a great start! © 2009-2016, Olentangy Alpines-Mark V. Baden Enterprises. All rights reserved.